Previously, we made fun of R3 for complaining about a billion-dollar Option Contract that Ripple decided to terminate. R3 should have used a smart contract! Now we have the actual court documents (thanks @MrDuke67). I can’t help but feel sorry for Ripple here. 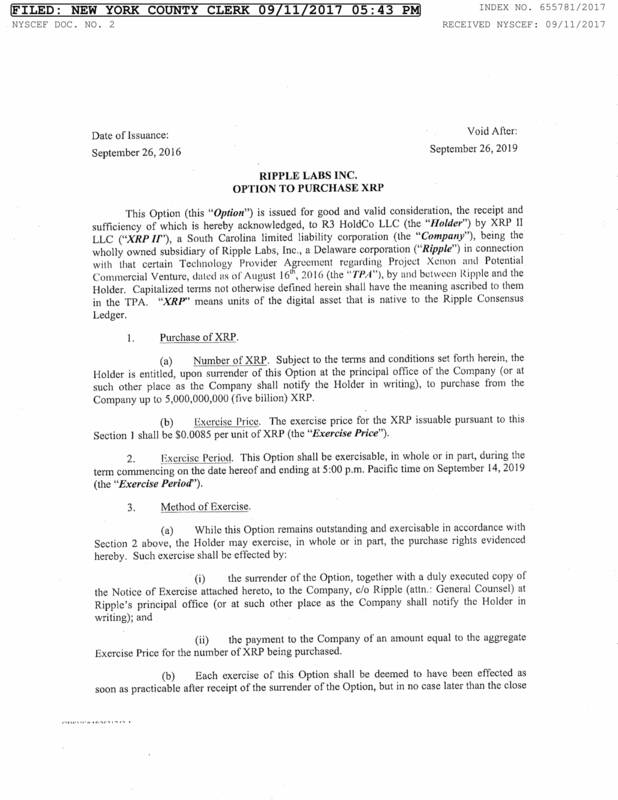 It’s hard to imagine anyone agreeing to a partnership with R3 unless fraudulently induced, and the Option contract does kinda look like a freebie (full text here). To make matters worse, the Option contract is now worth over a billion dollars, which is almost certainly more than Ripple’s entire company valuation (They raised $55M in last year’s Series B). R3 goes to one of its banking partners for a billion-dollar loan*, using the XRP Option as collateral. R3 acquires Ripple for a mix of cash and stock, up to a billion dollars. Withdraw the complaints, exercise the Option, sell the XRP, pay back the loan in full. Burn Ripple’s business to the ground. Lo and behold, we’ve created shareholder value for all. Blockchains really are like magic. *Better yet, tokenize the Option Contract and do an ICO.